← Is it just me, or does this look as unappealing as it is unhealthy? photo by me-could you tell? 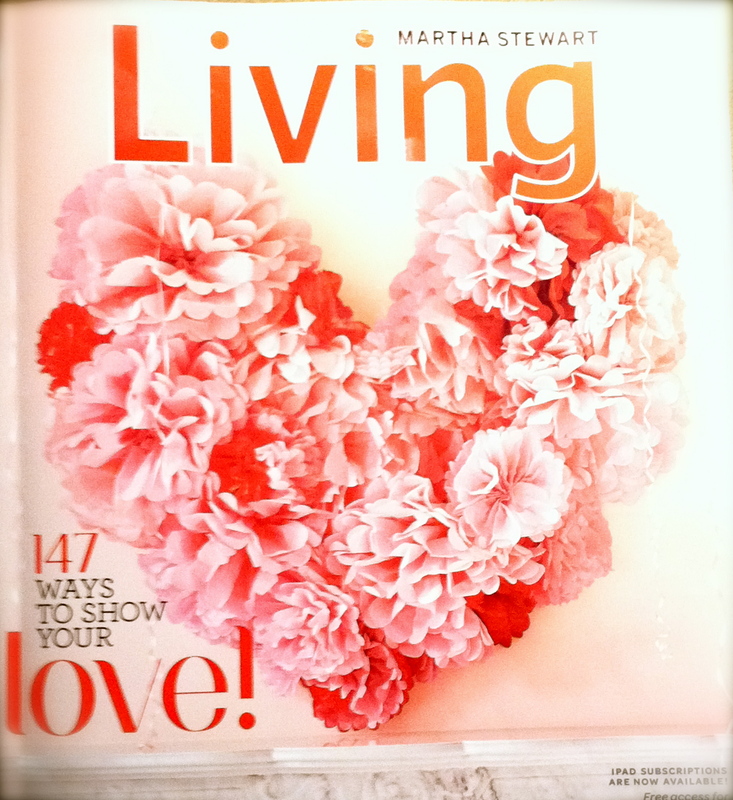 This month’s Martha Stewart Living cover: “folded tissue-paper blossom heart decoration” made for a four year-old’s Valentine’s Day sock hop party!? According to the notes it measures four feet across! “Show your love” with a craft-induced aneurysm. Level with me. Do people really do this stuff? Posted on January 6, 2012, in Holiday fare and tagged Crafts, Humor/Commentary, Martha Stewart, Martha Stewart Living, Tissue paper flowers, valentines day. Bookmark the permalink. 8 Comments. The truth of it is that healthful cooking techniques need to satisfy only THREE basic and simple criteria the food you eat should not have excessive amount of fat and sea salt i.e. should not be high in calories, it should retain its nutrients i.e. it shouldn\’t be empty calories and above all, it should taste good. One time I tried to make some Martha Steward crafts. It started out as pumpkin chocolate tart for Thanksgiving. By the time I was done with it, we cut it into pieces and used it for name place cards. It could not be eaten, drilled, shaved or sanded. And trust, I have a a guy in the house who does all that and more! The guests were so impressed that the name place cards looked like a tart…I was sent so many dentist bills the next day we have never again tried any of these crafts. We sent the dentist bills to Martha, but did NOT get a favorable response back. I called her about this. She said was really sorry but that if it didn’t work it was all your fault.